Onstream-Guide featured flies have been stream tested all over the world! They work. Specialist river flies designed for trout streams. This feature will be updated on a regular basis with new, innovative and old and tried and tested fly patterns. Of course nothing is new in fly fishing...the ideas on which these flies are based may have been around for centuries. But guess what the trout haven't changed that much. We like to think we have gotten smarter. Our forefathers knew far more than we give them credit for. So when credit is due it is given. Many flies like Al Troth's legendary river fly the elk hair caddis are barely modified from the original recipe. Others like the black magic nymph are far more modern tied on modern barbeless jig hooks, superb quality tungsten beads. Why the bead? It gets the fly down fast to where it fishes best. This is one of my personal favourite flies to fish under a bouyant dry fly, a technique often reffered to as clink and dink or duo. 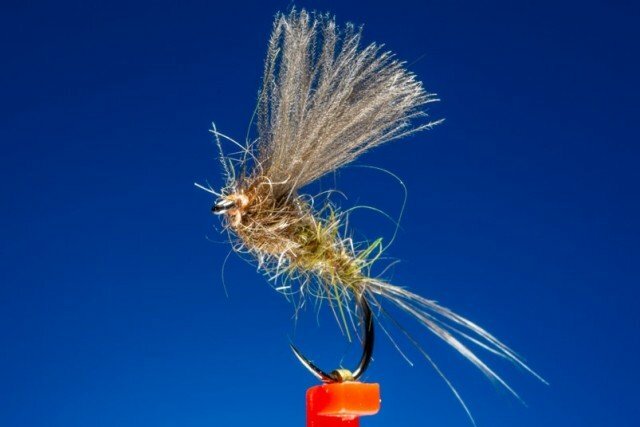 This fly has all the essential triggers that scream to the trout "here is a meal!" . The right profile, sparkle, translucence and most important of all inherent movement. What does it imitate? Like all great flies it copies everything to some degree but nothing exactly. To buy Black Magic nymph click on the picture. To the tiers there is no exact need to use the specified materials. Rather like Ford was (mis)quoted as saying any colour as long as its black will work. This particular combination works well because of the combination of translucency/reflectiveness. To buy these materials please click here. The fly is particularly effective as a pocket water "nymph" where a large proportion of the trout's diet might in fact be from drowned terrestrial flies that the black magic nymph captures. Moreover it has that inherent super soft but strong CDC hackle giving the fly the appearance of movement and hence life. A movement no wild trout can resist even in barely moving water. 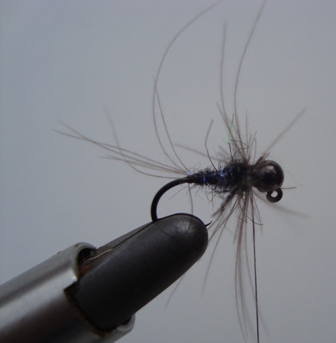 CDC is a superb material for immitating the wings of Mayflies and Caddis. Onstream-Guide Match The Hatch (MTH) dry flies couple CDC with body innovative materials to produce a super effective stream fly. I have used these flies from Colarado in the USA, Alberta in Canada to Kashmir in the Himalayas. Wherever trout live and no matter how tough they seem they will take this fly if it is presented correctly. Theses flies are also on my leader when I'm dry fly fishing for those magical autumnal grayling. Fishing with a back drop of trees changing colour and warm sunshine is even better when the flies are effective and the rod bends into lively surface grayling. Match The Hatch series: Pale Watery. An Autumn grayling favourite! The first fly in this series is the MTH mayfly. Available in colours pale watery, light olive, medium olive and dark olive. This fly is a consistent pattern throughout the season and will take trout often in the lack of a hatch.These flies are tied on high quality Japanese hooks an excellent fish holding barbeless pattern in sizes 18, 16 and 14. Some good advice and something that can save you money on fly patterns, even when imitating dull generally small natural river insects, is to buy flies at the contrast ends of the colour spectrum. For example a dark olive Mayfly would be at the opposite end to the pale watery patterns. MTH mayflies: If dark olives don't work the pale wateries usually will...and visa versa! In plain English don't bother imitating all the colour shades between these two extremes. One of these will generally have the best contrast and hence visibility in any given light/water conditions on the stream. Dark olive mayfly patterns are generally fished early in the season however they can be fished year round to good effect.